This is my first time making it. I happened to get a lot of suitable cucumbers - the small, short variety - from a friend, and this was my first thought. I would have used flowering dill, but I couldn't find any - apparently, there's been a shortage. I used some whole dill seeds instead, which give similar flavor. Clean the cucumbers, and place them - whole - in a bowl. 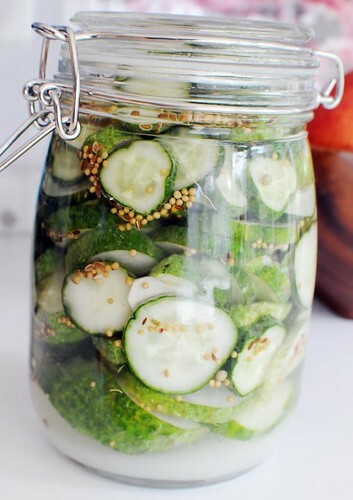 Dissolve the salt in the water, and cover the cucumbers. Let it sit for 24 hours. about 200 ml white distilled vinegar (12%), or as much as you need to fill your jar. Fantastic picture...they look so mouth watering! Will have to try this soon.